These might not link closely with each other but they are the flavors of Antoinette's latest collection that breathes a new life into classic French pastries. These predominantly mousse-based cakes are very light, fruity and delicate, without failing to pay attention to the slightest aesthetics details. It was an exhilarating journey to savor all of them in one sitting but I couldn't pen down my thoughts immediately them as I wanted a longer to time to reflect and sort out the feelings. To explore the area around Tokyo besides the usual Hakone, Kamakura and Kawagoe, I embarked on a one-day road trip to the rural town of Chikura. One reason was to escape from the city crowd on a public holiday in Japan. Second, it was not one of the places listed on any foreign tourist brochures (I guessed many Japanese might not even be aware of this place). Third, there is a famous fish port in Chikura and there are chances that we could try fresh and cheap seafood there. One word, Shiok. Or maybe make it two then, Super Shiok. These were my feelings as I ravaged heartily through my bowl of abura soba ramen, accompanied with the free-flow of "sambal chilli" and other condiments like garlic chips, chilli powder, fried noodles chips, etc. Menya Gachi is one of the six concept house by Mensho, a trendy ramen group with a cool website that details the menu and latest updates of each shop. Menya Gachi offers several kinds of abura soba and I had the Kamatama Abura Soba (¥890) which came with a raw egg yolk, konbu flakes, spring onions and pork belly which were incredulously tasty and flavorful. I'm guessing that the pork could have been braised for long before being burnished slightly as the fats and meat have all fused as one. But what caught me fancy was the thick burly noodles that are coated with the delicious sauce and egg yolk goo when you mixed everything well. It was already hard to resist but the tasty levels raised by leaps I added in the condiment that looked like sambal chilli-lookalike. So fragrant and it resembled a good bowl of Chili pan Mee but slightly wetter and only mildly fiery. I soon realized that the flavored egg I'd added was optional as I was too busy enjoying everything well. I wondered why it got me so late to visit this shop even though I've learnt about this place many years ago. So much better than having tsukemen and ramen (I mean the soupy kinds). A return is a MUST. Chocolate lovers will rejoice in the "bean-to-bar" movement in Japan recently as there is a number of chocolate shops figured high on my agenda. I am no chocolate expert and I cannot rate which one is the best since I had not try the exact same items from each store. 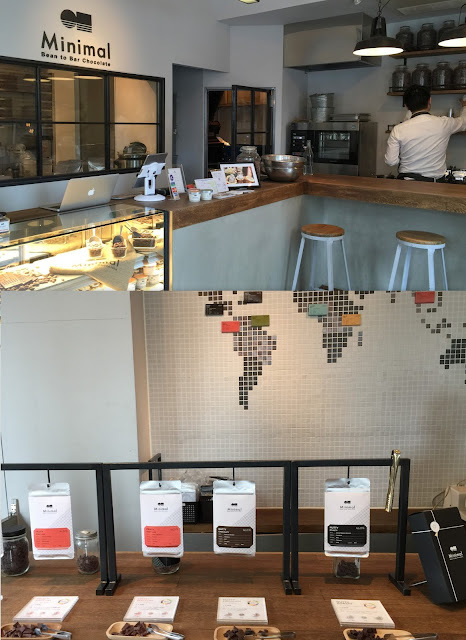 But first, let me share about Minimal Bean to Bar, the first shop that championed the bean to bar concept since 2014 in Yoyogi-Hachiman. Like the name suggest, the tiny space upholds a very minimalistic design with a bar table to sip some delicious chocolate drink. The beans are sourced from Tanzania, Vietnam, Columbia, Honduras, etc and they undergo a tedious process from roasting, winnowing to molding and packing. Samples of the chocolate bars are available and the date of production is labeled on each pack. Don't expect the bars to be as cheap as those from supermarkets as there are afterall, hand-made chocolates from scratch. But I think it is still worth the occasional splurge as they taste very different from brands like Cadbury, Lindt or even more high end brands like Godiva. The bars are clean and sharp in the flavors they represent. The minimalistic menu only has ice creams and beverages but you can be highly assured of the quality here. The Hot Chocolate was freshly concocted with the chocolatier's choice of bar, which happened to be a citrus one for me. The drink was unbelievably intense and rich, yet so soothing that it has a calming effect on my mind. It wasn't achingly sweet nor creamy; just the taste of chocolate with cacao nibs for some lovely textural play. The citrus notes only emerged from the aroma and not the taste. And this turned out to be my favourite after sipping the hot chocolate from all three places. And if you are game to try something unique and exotic, get the cacao pulp juice. The juice is extracted from the thin layer of white pulp around the cacao seeds. In fact, I learnt that it actually takes 25 cacao fruits (about one pineapple) to produce one quart of juice. No wonder one small shot cost around ¥400! It tastes exactly like soursop juice to me, very refreshing and fruity indeed. But I think I would stick to my hot chocolate. Of the seven dining concepts at a Emporium Shokunin, Takujo Japanese Fine Dining looks like the one that is best for special occasions and thus I made a quick decision to bring the folks down for a Father's Day lunch. What I like about the menu is that there is a good range of ala carte dishes ranging from sashimi, agemono (fried items) to nimono(stewed items) and rice/noodles even though there is no sushi. However, it is quite hard to tell/guess the portions of the food as some turned out unexpectedly petite like typical fine-dining dish. This is not the typical kawaii cafe or bakery. In fact, La Boulangerie Pingouin has been here for 110 years. Formerly known as 精養堂, this neighbourhood bakery has renewed itself by adding a cafe space and making Penguin as the official new mascot for its shop. I'm not sure why but maybe the owner loves penguins very much. Many people have told me about this restaurant in Tsukiji that specializes in Uni cuisine.Though there are many other restaurants in Tsukiji that sells Uni rice bowls, I must say this is truly a dreamland for Uni lovers as everything is devoted to Sea urchin. For example, there is the Instagram-worthy rice bowl that is overflowing with so much Uni that the excess spilled out from the bowl or the 5 different types of nigiri sushi for diners to taste and compare the Uni from different sources. In fact, it has a few sister outlets in Tsukiji, each with a slightly varying menu so you have to do your homework in advance if you are looking to try a particular dish. What's so fascinating about the little red dot? Not talking about Singapore but the little red bean小红豆, the common ingredient for Japanese traditional desserts. I'm bewitched by red bean these days (probably because age is catching up), especially when they come in the form of red bean-butter sandwich that is no less addictive than a Kaya-butter toast. While people often say that there is a pot of gold at the end of a rainbow, I like to think that there's a pot of delicious soup brewing fast and furious in the heart of Orchard Road. Souper Tang, a Malaysian brand famous for hearty, nourishing brews and delectable Chinese cuisine has opened its first outlet in Centerpoint. The dishes are firmly rooted in Chinese herbs as the owners hold expertise in the Chinese medical hall businesses. Where most herbal soups are cloudy and impenetrable, there is more “clarity” here; likewise with the taste--all thanks to the owners' efforts to change the common belief that herbs are bitter pills to swallow. Take for instance, the Souper Tang Signature Soup ($26.90 for two, $39.90 for four), a nourishing concoction of conpoy, shiitake mushrooms, American ginseng slices, ginseng root, cord Yeps flower and fish maw. It did not reek of medicinal herbs taste if this is what you are imagining. Instead, the use of whole piece chicken and glutinous rice wine created quite a smooth, rejuvenating taste that would appeal easily to the masses, though I prefer it to be less salty. The Shi Quan - 10 Herbs Soup ($15.90/ portion) turned out to be the dark horse that rode my fatigue away. The use of wolfberries, Angelica root and osthmanthus bark gave this soup a pleasant sweetness that was not found in the Signature Soup. Not to forget the three slices of meaty pork ribs that made this dish an opulence to savour. While there isn't any fried dough fritters to enjoy this bowl of soup like Bak kut teh, there's something even better--Mee Sua tossed in XO abalone sauce ($3.90). Tossed in fragrant scallion oil, each strand of wheat noodles glided down the throat effortlessly, albeit too speedily that left me hankering for more. The Home braised pork belly in rich dark sauce served with Pandan buns ($18.90) set emotions running high as the slabs of tender meat showed off its glistening qualities under the spotlight unabashedly. Braised with plenty of soy and aromatic enhancers like Angelica root, star anise and orange peel, the pork belly proved to be maximum indulgence and devastation to the waistline. In that case, perhaps the Stir fried French beans with pu-er ($11.90) would do some redemption but only to a certain extent I guessed. Thanks to the braised minced pork and olives toppings, this dish is equally tasty as much as it is greasy. And I'm quite sure it won't taste that delicious and fragrant if there was less oil. For those who prefer to steer away from stir-fries, the Signature Souper Pesto Pot ($25.90 for 2-3) would serve as a one-pot dish that satisfy the green requirements for a day or even two. The soup reminded me of the matcha hotpot I've had early this year but this had a sharper fragrance of basil and pine nuts. I think this is a dish that would polarize a table of diners like durians as some may not like basil. I'm on peaceful terms with basil and I thought it tasted quite ok but perhaps short of the sweetness from a protein-based broth. Nonetheless, there's already plenty going on in this symphony to keep anyone busy; Red sweet potato noodles, Chinese spinach, corn, enoki, thick bean curd skin m, etc. and even a unique black fungus known as "Little Cloud"
Just as I thought my dinner was sufficiently nourished by all the herbs, greens and meats, there came one of my weakest links--Claypot Atlantic Codfish with Fish Maw ($29.90) This might pass of as relatively bland to some, but it was precisely the clean taste and freshness of the fish which made it a gem to treasure. 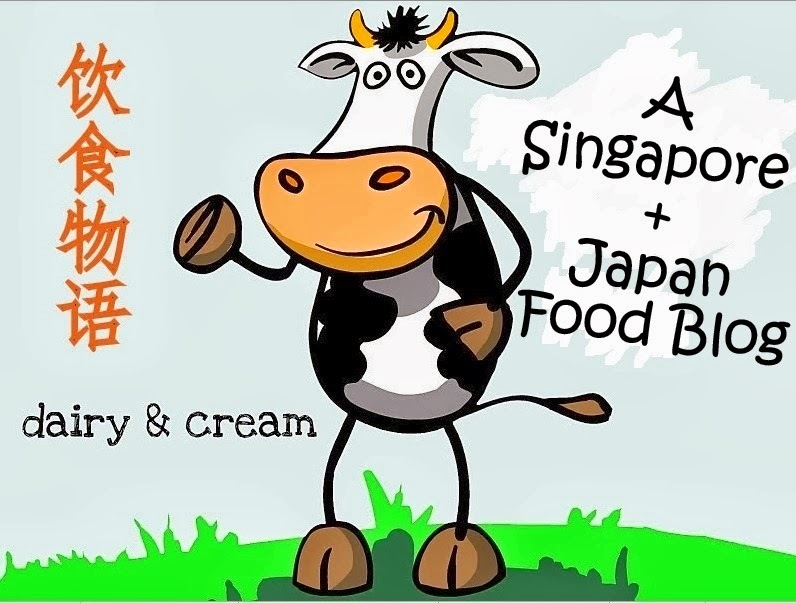 Cap of the meal with an ultra silky Beancurd ($3.50), served chilled, in either caramel ginger or caramel sauce and your body will thank you for feeding it so well. If I were to look back at the countless patisseries I've tried in Japan, I think Arcachon is the latest in 2016 to make it to my list of favourites. Located 3-minutes away from Hoya Station along Seibu Ikebukuro line, this shop is helmed by chef-owner Morimoto who used to train in France before returning to Japan in 2005 to open this shop. His shop is closely similar to patisseries in French where there is an array of breads, macarons, baked sweets, chocolats apart from the usual entremets. What I like about the petit entremets is that they are rooted in solid French techniques but much more daring in playing with flavors and textures. Some combination is not commonly seen and the overall sweetness is just right. Since Arcachon is some sort of a "neigbourhood cake shop" (yet so popular that queues form at the shop), prices sit at an average 450-540 yen, which is a very reasonable deal considering the complexity of the cakes. Hence, splurging on cakes from Arcachon is less likely to burst your budget compared to big brand names like Pierre Herme, Sadaharu Aoki or Hidemi Sugino. The flavor of rose in the white mascarpone layer is shockingly intense as its pink appearance; but I'm not complaining as I adore the floral tones and thankfully it is paired with tangy raspberry gelee, not lychee. In fact, I think this is even a more successful rose creation than PH's Ispahan. In between the moist genoise is the rose mousse which had an interestingly bouncy texture. Light and neutral-tasting cheese mousse which did not conflict with the tangy rhubarb. Simplistic as it might seem, I enjoyed the spiced biscuit base which had chunky nuts. I usually stay away from Rum baba as it is very bready but this is not. As the name "Baba", the liquor permeated every possible space of the yeasty bread and made me happily dizzy. I liked how the base is fortified by a milk chocolate spiral, which provided a welcoming contrast in both texture and flavour. The Ekinokusu エキノクス stirred a moment of dejavu as I had an exactly banana-oolong tea combination from Rue De Passy. Beneath the shiny chocolate glaze is a layer of milk chocolate that rubbed shoulders coherently with the smooth earl grey Creme beurre. However, it was too sweet and I prefer the Trio of Chocolateプールカ , which is more than what the name suggests. Much efforts have been channeled to play up on the aesthetics and flavors with pistachio genoise and crunchy toppings. Crisp, airy shell that hosted vanilla-accented creme patisserie which was tremendously delicious and melty. I'm not surprised actually but not every chef can excel in both cream and choux. This is excellent. While the cafe scene in Tokyo gets increasingly hot as new cafes continue to open by passionate young people, there is still many old, retro coffee house that continue to operate since Showa era. One of them is Kayaba Coffee, that still occupies the quaint old architecture at the cross-road junction of Ueno Sakuragi.